The Battle of the Ancre and Advance of the Tanks is the official film of the British Army’s autumn campaign on the Somme, which ran from September to November 1916. In 2012, the Imperial War Museum commissioned Laura Rossi to compose music in five movements to accompany the different sections of the film. 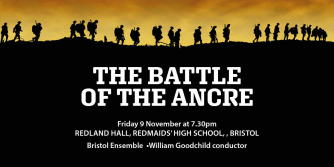 Join the Bristol Ensemble at Redland Hall, Redmaids' High School, to hear this poignant music performed live to accompany a screening of the film. The Battle of the Ancre and the Advance of the Tanks contains haunting images of trench warfare, notably of the mud that beset the battlefields, the waves of troops advancing into no man’s land, the use of horses and the first views of the ‘Tank’; the secret weapon which it was hoped would break the military deadlock on the Western Front.